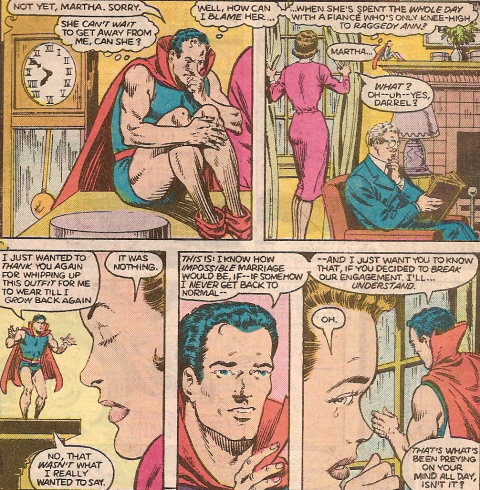 I didn’t realize it, but as these panels from a Doll Man comic book make clear, women really don’t like short men. Or at least really, really, really short men. I would like to apologize to Doll Man, and, indeed, all Doll Men, for being insensitive to their tiny little plight. For some reason that reminded me of when I used to work in a pub and because I am so small lots of men would get it into their heads to pick me up, literally pick me up like an infant, without asking me to show off to their mates. I am glad I work from home on my own now. literally pick me up like an infant, without asking me to show off to their mates. oh ew 🙁 sorry you had to meet those people. on the topic of picking people up, I can still pick up my brother (he hasn’t tried me yet) though it does hurt more now 😉 we’re similar weights (he’s slightly more) despite the huge size difference. I guess that’s what happens when short stocky girls grow up w/ tall gangly boys 😛 We look like opposites. fedoras are just deal breakers. And I’ve crushed on/dated some shorter guys. I have no problem with it, it just looks odd to other people. @kitteh how’d the hemp oil feel? @thenatfantastic: I’m sorry you had to deal with that.